About Hazel L. Message Hazel L.
The making of Leeds in a walking tour, for 4 people. Lovely kind guide who gave generously of her time and experience and told us so many things about Leeds that we would not have found out about on our own. Thank you so much! We had three generations for the 3 hour walking tour, my 86 year old and sprightly father and 22 year old son, who's a student. Hazel was clear in her speech and walked at a considerate pace. She was knowledgeable, engaging, friendly. We had a great weekend in Leeds and the tour was a real highlight. Thank you Hazel. TOUR GUIDE RESPONSE: Thank you Alex for taking the time to post such a complimentary review. hazel was excellent. I enjoyed my tour very much. Our guide Hazel was fantastic and really gave us a good overview of the City, which was the foundation for our weekend visit. She was very knowledgeable and informative on the city's history. 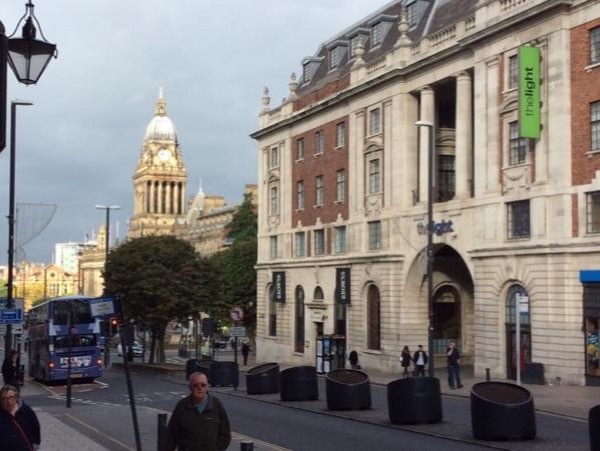 We would recommend the walking tour to all Leeds visitors. TOUR GUIDE RESPONSE: Thank you for your comments. Much appreciated. I hope we meet again. Hazel was the best tour guide I've had in 27 years of traveling. Hazel met me at the airport and we explored the Kirkstall Abbey on our way into Leeds. A highlight of the day outside of enjoying Hazel's company. Hazel's helpfulness in places to meet up with my daughter later in the day was perfect. I cannot say enough about my experience and Hazel provides you with a knowledgeable tour of the Leeds area. And if you are interested in architecture like I am then Hazel is an excellent fit! TOUR GUIDE RESPONSE: Thank you for your lovely comments. It was so nice to show such enthusiastic tourists around my City. Excellent, informative and fun tour with Hazel who proved to be really enthusiastic and engaging, happy to share her wealth of knowledge on Leeds. TOUR GUIDE RESPONSE: It was a pleasure to show the city to such lovely visitors. I hope to see them again next year. I have knowledge of Temple Newsam in Leeds if required. Talked with us before Tour to ask us what we were interested in seeing. Carefully answered all questions. Talked about interesting building with facts and stories. Spent as much time as we needed. Considerate and very helpful Tour Guide - Hazel went out of her way to accommodate our needs. We had one person of the 4 that took tour using alternatively a walking stick and wheel chair and was mindful of her needs. Would gladly have Hazel give us more tours. First trip to Leeds and Hazel made it a delight. TOUR GUIDE RESPONSE: The Booth family were a pleasure to show around Leeds.